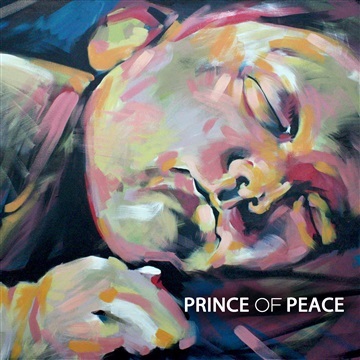 Prince of Peace is a Christmas album of original worship songs recorded at home with friends and family. These Scripture-based songs are intended to help us find ourselves in this story that changes the world. Each song looks at the incarnation from a different angle with themes of prophecy, mystery, joy, peacefulness, holiness, and calling. The Christmas story has perhaps become too familiar. Shepherds, angels, a manger, a star - we have heard and seen these images repeatedly to the point that we often miss the significance of this moment: the turning point in history when God came among us as a baby. This is a great mystery. St. Irenaeus in the 2nd century said that Jesus is the visible of the invisible God (see Colossians 1:15). The God we cannot see became flesh and blood and dwelt among us. It was always God's intention to be with his people. Of course, God came to turn the world upside down (or right side up). The world has often organized itself apart from God and people often treat fellow human beings as objects rather that people. God came to restore His good world. Jesus, the Prince of Peace, announced the Kingdom of God, which is the reality that God rules the earth with peace, justice, and love. Nothing could change this reality - not kings, nor rulers, nor any evil, nor death itself. God and humanity were already brought together in the person of Jesus and he would go on to overcome any obstacle that might keep us apart. All songs written by Jeff Hawker.